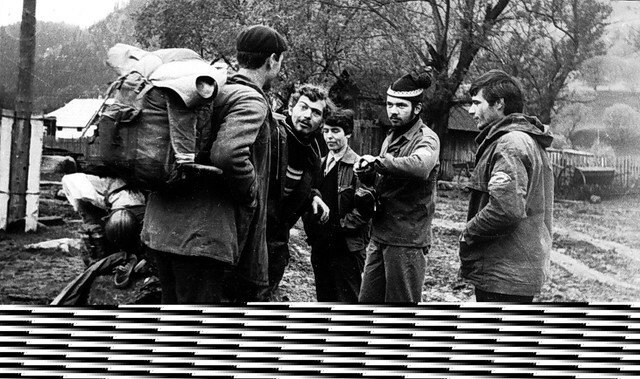 Dyatlov Pass search and rescue operation was unprecedented and was surpassed only 14 years later by the Chivruay tragedy on January 23, 1973. There quite a few similarities that are pointed out between the two tragic events. On January 25, 1973, ten students from the Kuybyshev Aviation Institute (KuAI), the leaders Mihail Kuznetsov and Valentin Zemlinin, started the route along the Lovozero tundra (the "tundra" is the mountains of the Kola Peninsula). On that day, a pass was made and on the border of the forest in the Elmraiyok valley they set out for the night. 26.I. on a frosty day (-24°C) they passed lake Seydozero, climbed up river Chivruay and pitched a tent in the woods with hot supper. Judging by the film later developed, it was snowing. Despite the failing light of the short January day, they all started climbing the plateau. In the diaries there are no records with motivation for such a decision. There are no reasons for this hasty step: it was the beginning of the route, they had enough provisions, trekking the pass was planned for the next day. They climbed the plateau on the northern path. The wind was nasty, but blew in the back. According to residents of the villages of Ilma and Puncha, wind speed reached 50 m/s. The temperature fell sharply. They crossed the plateau in darkness and stood at the precipice of the circus of Kitkuay river. They didn't go down in the valley of Kitkuay river all together. At first, probably, they stopped to reflect on the way. Five people dressed warmly and left. The remaining five, hoping that the scouts would return soon, spread out the tent and lay down on top of it. They could not pitch up the tent because of the strong wind. They didn't even bring they backpacks closer, or put on warmer clothes while waiting for the return of the ones that left. They could, but for some reason they did not. They were lying tight against each other. The last on the windward side tried to cover himself with the tent. Two of the scouts decided to return to the remaining group. The young Novosenov gave all his warm clothes to his female companion, and he himself remained in checkered shirt. Altshuler and his two comrades descended safely to the valley, but they found themselves in a trap: they could not reach the village without skis, and they did not have enough strength to go back against the wind. The deadline of their return January 31 passed. The blizzard and strong wind prevented the landing of rescuers on the plateau of Chevruay. They got there on skis only on 6.II. 10 m from the cliff of the circus, five frozen bodies were found and not far away - two more. From the inscriptions "KuAI" on the skis and a notebook it became clear these were the hikers from Kuibyshev. The search for the rest continued throughout the month. On February 27 in the valley of Kitkuay river at the exit from the gorge in 2 km from the circus were found two bodies, 10 m from each other. Their watch stopped at about 5:00. Only on 1.VI the last member, Altshuler, was found at the right slope of the gorge 400 m from the place where the last two found died. He was warmly dressed, but without gloves. His watch stopped at 4:33. Nothing foretold troubles. Every Saturday and Sunday of the autumn and the first month of winter the guys were together. Four of the group: Misha Kuznetsov, Valya Zemlyanov, Lidia Martina, Ilya Altshuler - hikers with great experience, graduates. The rest are freshmen, but not newcomers to tourism. Only for Artyom Lekant this trip was the first in this category, and not a weekend trip. They knew each other, daily communication at the institute, weekend training gave them emotional bond, they could feel each other and one might say sense the mood of the soul. The routing commission under the chairmanship of Veniamin Mochalihin said: the group was well prepared, the team was united, almost the whole group came to the defense of the route; leader Mihail Kuznetsov has done three times this route, and his deputy Valentin Zemlyanov - twice. And ... January 27 out of the blue came a message about the death of the entire group of the Kuybyshev Aviation Institute on Chivruay. The beginning of the road, there was no reason to hurry, but, in all probability, they decided to get closer to the pass so they can go over before dark the next day, since the January days are short. Residents of the village of Ilma said that on that day it was frosty, without wind. And here it is very difficult to understand, guess, predict why the group split. Something happened? Someone fell off the cliff and needed help, and so they acted, as would anyone have done, one for all and all for one? Or unable to keep up with the time, dark, bad weather, they needed to explore ... they knew, felt that they were not far from the forest zone where they could make a fire. The Chivruay tragedy was compared to the tragedy that occurred with students of the Ural Polytechnic Institute under the leadership of Igor Dyatlov in February 1959 in the Northern Urals. Similarities between the incidents are a lot: the division of the group, death from freezing in a group and then one by one on the descent from a slope, freezing under similar conditions, and underdressed. Both Chivruay and Dyatlov groups were blamed for hasty inappropriate decision to when to start a ascent etc. 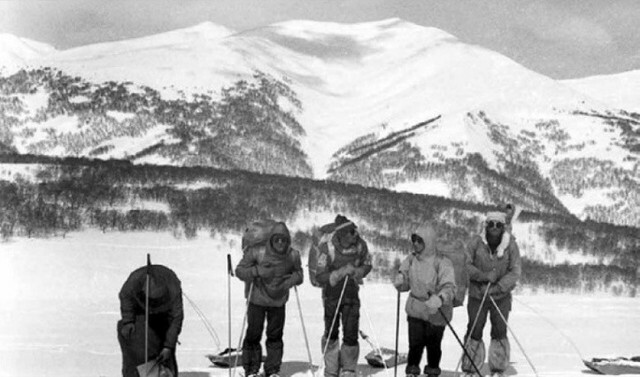 By the duration and complexity of the search operations, the number of dead - 10 people - the Chivruay tragedy surpassed Dyatlov Pass incident near the Dead Mountain. In addition we have the behavioral errors of tourists in the Northern Urals in 1959, their deaths were explained by other assumptions: military trials, UFOs, encounters with Yeti ... As arguments for these mystical theories are pointed the concealment of search materials and the involvement of KGB in the search etc. The darkening of the skin of those that died in the Northern Urals is identical to those that died in the Chivruay tragedy. On January 27, 1973, there were no nuclear tests, but on that day, an attempt was done to break off a cyclone with the help of a meteor rocket to weaken the severe cold that it had brought. In the cities of Kirovsk and Apatity, in the settlements of Ilma and Puncha, at that time, was recorded the highest death toll from freezing. There was similarity in the fact that the search for for the hikers was undertaken by the military services of Kirovsk, and the authorities expressed their condolences to the parents of the deceased, and also that the parents of Mihail Kuznetsov and Sasha Novoselov were not allowed to conduct a private investigation. On February 7, 2013, on an Grushin Thursdays, in the Valeriy Grushin's auditorium at Molodogvardeyskaya, 151, tourists and relatives of the victims gathered. Much has been said about the students, about their friendship, about their youth. We grew up and grew old, and they remained forever young, and only the guitar was silent this time. We did not sing a single song. It's understandable - everybody and everything remained in the past. Ed. note - I can't find any photos of the trek besides the header image that came with the article, although there should be films from the dead hikers. Find us MORE! We need the trek photos. I guess this incident didnt become very 'famous' because they all simply froze without any cattle/UFO mutilations etc? All theories are flawed....... Get Behind Me Satan !!! The two tragedies are similar in the sense that a team of trekkers lost their lives in mountainous areas during winter time. But there the similarities end. The Chivruay tragedy in 1973 was undoubtedly a genuine accident. Well the photos of these victims look less wholesome and so much more hippie-ish so I'm guessing nobody was really interested in a bunch of frozen hippies. That was totally just typed in gest. Teddy please don't think I was being disrespectful to your post or to the dead. It was more or less a nod to the political climate in the United States at the time of this event. No. About a case of Dyatlov group was many speak, including in a press much, and about this it is very rare, and that tell only in a municipal and regional private press. It became more known because some persons from group KuAI (КуАИ) were organizers and leaders of Grushinsky festival of an author's song https://en.wikipedia.org/wiki/Grushinsky_festival . Panorama of a venue of festival on the river Volga. On other coast hills which the Zhiguli (Жигули) is called are visible. Stage of festival of 1972. The chairman of festival jury - the known author of songs and scientist-oceanologist Alexander Gorodnitsky (Александр Городницкий). 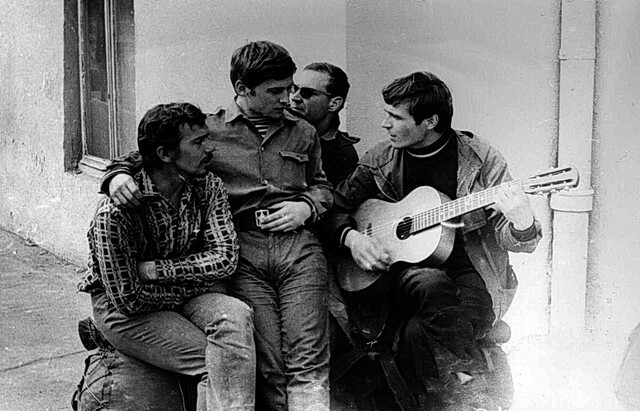 Extreme author of songs known in Russia Boris Vahnjuk (Борис Вахнюк) at the left sits. Stage of festival of 1976. Spectators sit on a slope of a hill in height about 80 metres. In 1978 at festival was about 240 thousand persons. Because of this festival the case with KuAI (КуАИ) group still remained to be known. Some other almost that similar cases are known only to their participants and experts. If to reject all unreal events both these of a case, really are accidents, but with the different reason of their beginning. I doubt that you so well know their similarity and differences that can describe it accurately and in detail. But there can be I am mistaken …? 1.In the early seventies many young men looked as hippie. There was such fashion. Therefore there is nothing strange in their kind. 2.This case was discussed in narrow circles of experts, but any agiotage it did not cause. Probably because now the press is more interested in sensations and reception of additional money in this connection. Then there were more realistic and moral times. That was totally just typed in gest. Teddy please don't think I was being disrespectful to your post or to the dead. Many publications about this case are written after repeated retellings between various people. Therefore it is a lot of stratifications of a different lie and imaginations. I have written that saw itself and is direct on a place of events. Compare that has been originally published in this forum, and define that more close to true. It was more or less a nod to the political climate in the United States at the time of this event. What do you mean in this phrase? Interesting turn of a plot. Just because I know this case not under books, and alive in nature. It is possible to tell that there I worked as Maslennikov, Baskina + Bardin + as Shulezhko and Ortukov in the uniform person. It is necessary to tell that how this case is described in P.I.Lukojanov's book, contains set of errors and very much is not correctly perceived by the extraneous reader. On January, 30th I was called by the head of one of groups of our section of ski travel (at the Moscow state aviation institute - university) Victor Samodelov and has informed that they have found some bodies on pass Chivruaj (these are Lovozersie tundra - mountains; Kola peninsula). They have informed on it in a life-saving service of Murmansk area. The chief of this service - Anatoly Ostrovsky (my good acquaintance and a companion) asked me when Victor's group will arrive to Moscow that I urgently would show films on which Victor has made pictures of the found out tent and bodies. And then with the captain of the first plane who should fly to Kirovsk (there there was a life-saving service centre) has transferred pictures to it. In same put I has shown films, has made prints and itself has taken off for Kirovsk next day. I was the head of a rescue crew of our section, therefore business trip from sport club of our institute and All-Union Main board on tourism have issued at once. There was a small scandal of that in 2 weeks I should defend the diploma in aeronautics on degree (as it is accepted in the USA) equivalent to the master of aeronautics. But all has managed. When I have arrived to Kirovsk, Anatoly Ostrovsky transfer me directly from the plane to the departing helicopter and we have departed on Chivruai, to survey a place and to transport bodies to Kirovsk. There was the big command including representatives of police, Office of Public Prosecutor, and a life-saving service. Weather was not so good - low visibility, a wind (weak), a frost approximately-20C (-4F). Such frost on Kola peninsula is felt worse than-30 … 35С (-22…-31F) somewhere in Siberia because there is very big humidity - Gulf Stream nearby proceeds and often blow a wind from Arctic regions. We have transported by the helicopter all found 5 bodies in 2 flights in settlement Puncha, and, next day have sent them to Kirovsk. Those who remained, searched some days Lovozersky tundra which has probably survived in vicinities with southern and West side. Weather has deteriorated definitively and to pass pass for searches above there was no possibility. The group of searchers has gone to detour on the lake of Sejd, through the Hank-lip. They surveyed gorge of a stream of Chivruai-ladv, but any traces have not found. Sorry, I have many photos from this event but now it is difficult to me to publish all at once. I will try to make in due course it with explanatories. While I can only that is already ready to this text. In 2010 I objected Bujanov concerning that he has considered this case as analogue to it «the avalanche version». He has answered me that at Lukojanov all is written correctly, and I do not know details of this case. It is especially ridiculous if to consider that I there was from beginning to end searches, and Lukojanov there at all was not. Besides trustworthiness it is possible to consider as criterion that at Lukojanov almost all surnames and weight of details are mixed. I had an impression that Peter Ivanovich Lukojanov, and who wrote not that of its "co-authors". I have worked with Lukojanov about 20 years in section of ski travel at Main board on travel of the USSR, and well I know, how carefully it selected a material. But here set of errors that does doubtful its authorship. Here my remarks to Evgenie Buyanov's text still in 2010. This erroneous name , ZemljanOV - its correct his surname! have begun a route on Lovozersky tundra ("tundra" is mountains of Kola peninsula). This day have passed pass and on wood border in a valley of Elmrajok have risen on a lodging for the night. 26.1. In frosty day (temperature-24 °) have passed the lake of Sejdozero, have risen on the river of Chivruaj and in wood have arranged a halt with hot meal. This day they did hot meal only on morning parking. Judging by the film shown later, fairly blizzed. Did not blizz, and there was a local drifting snow. Films were shown by me, therefore it is exact. If I will find I will put сканы from those films. Has found, we look …. It is a picture made them above the top lake of the river of Chivruai-Ladv (see the map-scheme). From here to rise ~ 80 m (250 ft) on height at movement on distance ~ 1 km to an exit on a plateau. Visibility is much better, than at Dyatlov team. And snowstorm it is not visible. Despite start twilight of short January day, nevertheless have begun an ascension on a plateau. Lifting have begun far before dark, still was about 14.00 (the photo sm), Darkens at 17.00. For 3 hours Chivruai can be passed. Has detained them, and the main error was that have not understood during time - the basic strength of wind is shown only when will leave on a plateau. But here what it adequately to estimate, decent experience and knowledge Kola is necessary. Even other similar areas here do not suit. A relief is original. Motivation of the decision is unknown. The reasons of haste are not present: the beginning of a route, products is a lot of, pass planned to pass next day. On a plateau have risen northern way. Not, through well-known "horn", which dispose to the west of this northern way. On a photo it is visible that they have already passed lifting by northern spur. And western положе and is easier. V.S amodelova's group which then also has found out them on a plateau, has noted exactly same «a trace for a minute» which appears and in the Dyatlov everyday. Just on an exit of the western spur. And between them anybody Chivruai did not pass. Wind be strong, but barrels in a back. Anything similar. The wind blew with W-N-W. If it blew in a back, they would fly by 3 km all these on a plateau, «as plywood plane over Paris». That's just the point that the wind was almost counter and strong. To go against a wind it was simply impossible. 3 years prior to this case, on rescue expeditions - searched for the lost schoolboy from Krasnye Zory-town, I got to a wind of such force on pass Jumegorr. There simply put and dragged on snow unevenness. And not only me, and people with more decent body`s form. There was a wind force of 50 m/s (about 100 mph). Such wind complicated in low temperature of them also has detained. As it was found out for ever. According to inhabitants of settlements Ilma and Puncha, its speed reached 50 m/s. The temperature has sharply fallen. Here that was, was! Hydrometeorology station Revda (in Ilme, especially in Punche - already then this settlement of geologists was uninhabited - hydrometeorology point was not.) gave -28C (-18F) and impulses more than 50 m/s (about 100 mph). have in the dark passed a plateau and have risen at breakage of circus of the river Kitkuaj. They on top were for certain still before dark. From a picture at the top lake on pass Chivruai-Ladv, to a place where them have found, all that of 1,5 km, and on a plateau they have passed only 500 m. Will go down at once in Kitkuai in their case it was impossible, there difference of 200 metres (650 ft) and a bias nearby 45…60 degrees. At their such wind would leave downwards head over heels, with all that it implies. If they have passed all plateaus, problems would not be, they have passed only a crosspiece between Chivruai and Kitkuai. The further way should be on W-N-W along breakage to Kitkuai, 2,0 more … 2,5 km (~ 1.5 mil). It would be possible and try to go down to Kuftuai, but it absolutely on a meeting to a wind. To go down all together in a valley of the river of Kitkuaj did not become. No "Became", and "could not". Why, I have written above. At first, probably, have decided to spend way investigation. Five persons heat have put on and have left. The remained five, hoping that scouts will soon return, have spread tent and have laid down on it. To put tent on a strong wind to them it was not possible. But after all they could bring there backpacks, put on warm things and expect returning of the left. Could, but so have not made. They lay, densely having nestled to each other. Extreme with наветренной the parties tried to cover itself tent. No, all not so. Not so it is romantic, and not so it is resolute. Them have found in 200 m from tent. Apparently, they came back from way investigation to Kuftuai. Hardly they could leave far in those conditions. They had all signs cold stress, for example, when the person thinks that to it hot and starts to undress. That is interesting, have found them in March, next day, after I have left from the second calling of searches. The helicopter has blown off clods of snow at an airfield and has seemed what that фал (a rope, clothes piece.). Before that place many times (some tens, have sat down not honeycombs) examined and did not notice any signs at those stones where they have then appeared. Altshuller with two companions has safely gone down in a valley, but they have appeared in an original trap: without skis settlement not to reach, and to return back against a wind there were no forces. It too does not represent the facts. The wind below, especially in those places where them then have found, always happens essentially smaller. They any more did not have forces and heat stocks what to resist to a cold. And they have frozen. All had movement signs on a logical trajectory of returning to tent. By 2 different variants. Ilya Altshuller was all in 300 m (1000 ft) from tent. But in 80 m (250 ft) more low under breakage. To rise there basically it is possible, and to all signs it went upwards. Control term has expired 31.01. Snowstorm and a strong wind have prevented disembarkation of rescuers to a plateau of Chivruaj. They have reached there on skis only 6.02. It does not represent the facts at all. Viktor Samodelov Group found them as 28.01. January, 29 evening they were in Kirovsk and have informed on a find to A.Ostrovsky (chief rescue service of Murmansk region). At the Same night they have left to Moscow, preliminary having called me and having reported the matter. January, 31 films with found out group KuAI have been received, shown and printed. In particular that is resulted above. In the night from 1 for February, 2nd I have taken off for Kirovsk. In the morning on February, 2nd, Ostrovsky has replaced at once from the plane to the helicopter (Mi-4) and we have departed to remove group on Chivruai. 6.02 Kirovsk`s rescue team sat already on Punche and 2nd day was engaged in searches on the Southern extremity of Lovozerie and in a valley of Kitkuai. Weather was bad, to rise on a plateau for sense searches was not. Swept, and there was a low visibility. And so till February, 10th. Then I have left. On hands to remove group from a plateau it was impossible, there by helicopter that was necessary to take out all to 2 flights. The third have removed rescuers. In 10 m from circus breakage have found out five frozen bodies and nearby - a two more. On inscriptions on skis and in a notebook of "KuAI" it became clear that tourists from Kuibyshev. It was informed by Victor still on January, 29th. Searches of the others proceeded all the month long. 27.02. In a valley of the river of Kitkuai on an exit from gorge in 2 km from circus have found a two, in 10 m from each other. Them have found not 27.02, and where that in 20 dates of April, or in general in the beginning of May, when a valley of Kitkuai of the beginning already thaw. In February there to snow completely and to find anything it was impossible. There snow element from tops. All time only strews, instead of decreases. Their hours have stopped about 5 mornings. Only on June, 1st at the right slope of gorge in 400 m from a place of destruction of a two have found last victim - Altshuller. He has been warmly dressed, but without mittens. Hours have stopped at 4.33. Besides the lie, Hours have stopped at 6.05 with seconds, Yury Kozin dictated me this time when I wrote the detection report. And when Jura has warmed them, they have gone. It was the ending of our epopee with research of a stop of hours on the frozen corpses. In March we froze them in any ways. Then have found, under what conditions they freeze. It was necessary to find out only, will go then or not. Also were afraid that the clockwork could be ended. 4.33, IIRC (If I Recall Correctly или If I Remember Correctly), this time which was on hours at A. Novoselov. On duration and complexity спасработ, чивруайская the tragedy has surpassed failure of Dytlov in a death toll. Interesting, as here has not done without false assumptions about any «military tests», « secrecy » materials of search and participation in it "KGB". Yes. The version: «Have left on foot through the North Pole to America!» Was one of the first. «the condolence of the authorities», etc. with Dyatlov case is a lot of Signs of similarity of this failure. It is a lot of, also what? There was an avalanche? There was a transportation to 1,5 km (~ 1 mil)? There were traumas type …? They escape from tent? It is not necessary to tell about what have no representation. There would be a possibility to go down, there would be no case. division of group, destruction from freezing, - group in shelter and one by one on a slope. About what "shelter" at Dyatlov team talk ?? Or at us already the flooring began to be called as shelter?? 1. Well and where here meaningless actions and uncontrollable losses of equipment?? 2. At such "carefulness" of preparation and a material statement, it is possible to tell everything. I do not learn the Item And. And it can any more it, the book that left already then. I feel, here without "co-author" has not managed. And you still try to assure me, what all that is written - the real truth?? Well-well …. Tamara Muravyova and Sergey Kuznetsov, Mikhail's younger brother, were the only ones who made sure that they were allowed to be identified. The children in Kuibyshev were buried in closed coffins. As Tamara recalls, the skin of her friends was of a strange color: someone brown, someone almost black or yellow. Everyone had empty eye sockets, eyes burst. Sergei Gusev allegedly had medical experts discovered signs of oxygen shortage. Death occurred at about five in the morning (plus or minus half an hour) on January 27. We need the AUTOPSY REPORTS. In America, Hippie culture is still not a very celebrated moment of "enlightenment." I think now it has a lot to do with the fact that the Vietnam Conflict is the source of a lot of pain in living memory. Our men came home from a war they did NOT believe in or want to fight only to have a bunch of Hippies spit on them and call them "baby killers." So to be a Hippie in the US is not at all considered to be of a culture that believes in a peaceful existence. We consider Hippies to be filthy, drug-addicted people that don't want to work for a living and in a sense there's resentment that working Americans have to support them. I don't think they look particularly hippy-ish. To me, hippies, had the shoulder length or longer hair, maybe beards and mustaches or not, but,definitely, with the LONG hair. These guys just look regular, short haired men, some more clean cut than others, but, they don't look like hippies to me. Forgive me for sounding stupid, but, I thought with the type of restrictive government the former USSR had, that they would even allow men to grow their hair long and have they hippie attitude. I'm not an expert on the former USSR, just what I learned from all my classes from high school and college, but, I just didn't think they allowed that kind of thing, hence, not understanding too much your comment about nobody being really interested in a bunch of frozen hippies. I'm not trying to sound snarky or anything, just curious and wondering. Hippies or no hippies, obviously something happened to the Dyatlov Group that was extraordinary and resulted in the area being off limits for several years etc etc. I will answer today shortly and only in one theme. Tamara Muravyova and Sergey Kuznetsov, Mikhail's younger brother, were the only ones who made sure that they were allowed to be identified. There is no it not is so. About Tamara Muraveva I cannot tell anything (I it some times saw on Grushin Festival, but personally it is not familiar), but Sergey Kuznetsov at that time was not in the city of Kuibyshev (now Samara). Because it was the cadet (student of military school) Yaroslavl military financial school. His father the colonel (in resignation) Alesey Mihajlovich Kuznetsov buried and identified Michael's body. I am well familiar with them with everything, inclusive Michael's both sisters - Tatyana and Galina. By the way, Michael was named after the father Alexey- (or was named the grandfather Michael younger). They buried all at various times, therefore not unique who identified bodies. For example, I am well familiar with Tatyana and Olga Krivov, sisters Yury Krivov. Their parents too saw Yury's body before funeral. About the others I cannot tell that defined not Ilya Altshuller's brother - told that to me that his parents have not allowed to look to it at a body because father Ilya it saw and has decided that the brother is very young what to see such terrible kinds. All dead people after several days lie on air, have an ugly appearance if to understand it simple people. Especially if the death is the violent. By definition in medicine: violent death is that which has occurred not for the natural reasons, that is if it not an old age, and not accurately established illness. In other words - all rest, including accident. The children in Kuibyshev were buried in closed coffins. Certainly, after more than one weeks from the moment as them have found and have brought to Kuibyshev, they were already a little decayed. Besides, at our country have rules that transportation by any transport unpacked in a zinc box is not allow under the sanitary code. From Kirovsk (where did autopsy) to Kuibyshev (where they lived) distance equally 2500 km or ~ 1500 miles. As Tamara recalls, the skin of her friends was of a strange color: someone brown, someone almost black or yellow. Brown (it is usual colour of a corpse which more 1 week was on air) it and is black + yellow and for the person unusual to corpses, it also an additive appraisal perceptions. So in what there is a question? Everyone had empty eye sockets, eyes burst. Sergei Gusev allegedly had medical experts discovered signs of oxygen shortage. Signs can be any, including false. Besides, when 5 persons: Michael Kuznetsov, Yury Krivov, Yury Ushkov, Sergey Gusev and Alexander Pirogov froze in their tent could powder with fresh snow slightly. In a coma stage of freezing snow could get to respiratory ways and give signs of oxygen shortage. In Michael Kuznetsova and Yury Krivov such signs have not found out. Death occurred at about five in the morning (plus or minus half an hour) on January 27. Interesting, whence they took such data? I know precisely (because I was there and then), what exact time have not been defined even when these 5 persons have been brought to Kirovsk and autopsy has been spent? Though by calculation by which we did together with the chief of a life-saving service of Murmansk region - Anatoly Ostrovsky - most likely they were lost in the evening on January, 26th approximately in the range from 20.00 (08.00 PM) till 24.00 (00.00 AM) local time (UTC +3h) . It is the strangest to me to read that people who there were not, and have no corresponding primary information, know about it better those who was engaged in it directly. If I knew that in 45 years after that, me about it you will ask, I necessarily took a copy. Now it is necessary to request archive Office of Public Prosecutor of the city Kirovsk of Murmansk region what to receive a copy. I am not assured that as it is necessary under the law, this case has not been annihilated after 25 years its termination. That is it should be in 1998. But I precisely do not know, can be it have kept, as Dyatlov group case. Thanks you for specification. I any more do not remember, we spoke about what concrete questions, but if I correctly remember, it was a question that Valentine Zemlyanov is a little similar to Hippie. It can be, though at us then not broadly was «the culture Hippie» is extended. However appearance of young men could remind them. As far as I understand, it has been connected with sensation большей freedom, in comparison with the previous period of history. With this phenomenon at us actively did not struggle, but, will tell so, it did not welcome. I at all do not know, whether were at us then classical hippies? Though, quite probably, but it was not the mass phenomenon. I apologise, but it not a theme for conversation here. There can be it it is necessary to discuss in other section of a forum? I want tell that it does not concern neither hippie, nor to Chivruai. The Chivruay Group passed lake Seydozero, climbed up river Chivruay. Well its in The Arctic Circle, so bad weather hereabouts could certainly have accounted for the demise of this Group. Its not unusual for the Military of any Nation to become involved in the rescue efforts of missing civilians. Similarities with the Dyatlov Group seem only to go as far as potential bad weather and a search by the Military. NO MYSTERIES by all accounts. No TENT mystery or FOOTPRINTS mystery or FIRE mystery or TREE mystery or DEN mystery or BODIES mystery. ETC ETC. But then again maybe there is more to this case than meets the eye. The Chivruay Group passed lake Seydozero, climbed up river Chivruay. I here that do not understand that …? You want tell me that new about a place which I know better than own ranch? 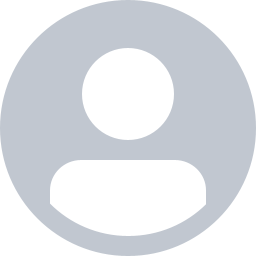 Or you personally participated in these search works and assorted their all details? Well its in The Arctic Circle, so bad weather hereabouts could certainly have accounted for the demise of this Group. And about weather I too can hear that that new after went in these places more than 50 times from which more than 40 times went in the winter? How you believe, what was weather when Chivruay Group took place Chivruay pass? Its not unusual for the Military of any Nation to become involved in the rescue efforts of missing civilians. Yes. I speak about it any more the first year when who that asks about it, on any of forums devoted to this case. It as well as in event Dyatlov Group. All is absolutely identical, except a place and the reasons. Similarities with the Dyatlov Group seem only to go as far as potential bad weather and a search by the Military. NO MYSTERIES by all accounts. In event of Dyatlov Group too there is no special secret of tent. These secrets arise only in heads of conspirologists. Chivruay Group did not establish tent, they were covered to it from a wind and more did nothing. To put tent in their event it was almost impossible. Therefore and secrets are not present, as well as in case of Dyatlov Group. There all the network as usual happens in such situations adjusted for that time. In 1958 in Subpolar Ural Mountains Dyatlov, Bartolomey and the Khan (it is a surname such) in 3 day of independent movement at bad weather at all did not establish tent. Simply to it were covered and have established props from ski sticks. In such condition they waited bad weather two days. Who has thought up «TENT mystery», I do not know. I have a doubt that the one who has thought up her too nothing knows about how put tent in different conditions. If it cut itself Dyatlov Group it does not concern to TENT mystery because it does not concern at all tent. It is psychology of behaviour people in an extreme situation. Why they behaves so, instead of on another, I wrote about it, as quite real hypothesis. or FOOTPRINTS mystery or FIRE mystery or TREE mystery or DEN mystery or BODIES mystery. ETC ETC. These secrets too do not exist. As well as does not exist "TENT mystery"(c). Them diligently think out that the invented sensation would not be gone. But then again maybe there is more to this case than meets the eye. You can give an example, why it is so? Well The Tent Mystery is this ; Why did The Dyatlov Group leave The Tent ! ? And why was The Tent CUT in several places ! ? I have not time to look through and answer all constantly. It is truly. Only it turns out that one "why" directly follows from another. The reason is available one. More precisely it is a consequence from the same reason. Here there is the obvious frustration of mentality caused from the outside. The reason should be very strong. They have left a unique place around where they could survive at such weather. Therefore any small reasons, that type that it became cold, a blockage of tent or they were frightened what that of noise outside of tent, cannot cause. For example, you will not jump out of the plane at its flight if in salon light has gone out or if plane has failed into «air pocket»? Here should reason be much more serious. For example, it is direct and informal threat of life. And this threat should concern all at once and simultaneously. And its level should be запредельно high. Why I say, what is the most probable, what such can be at infrasound influence? Because there are such researches when there is such influence on resonant frequencies an alpha and scale of rhythms of a brain the person can have a Changed Condition of Consciousness. This same that reminds a panic - the person aspires to leave this place as soon as possible. It is just that, as was occurred Dyatlov group. I will tell at once, these researches were indirect. As to receive good characteristics it is possible only in laboratory which sizes are almost impossible, there were influences by the big levels of a spectrum of sound frequencies of a wide range (small premises break the form of a wave and there are difficult frequencies - oberfrequencies) with that what to receive the response to frequencies of biorhythms of a brain, and influence electric potentials on pure frequencies of biorhythms. There it was traced encephalogram (activity of biological action of a brain) if there were dangerous effects experiment stopped. Thus all chain of effects of such phenomenon has been tracked. I already some times spoke: all necessary and sufficient conditions for occurrence of the phenomenon of an infrasound of the necessary frequency and influence level under natural conditions there exist. Therefore it is easy to present that as soon as the group has received the necessary dose (this dose is accumulation) influences consequences will be shown. Even if such condition arises with some disorder at several persons, that is such psychological effect - «crowd effect». In this particular Topic we are supposed to be looking at potential similarities between the DYATLOV GROUP demise and the CHIVRUAY GROUP demise. There doesnt appear to be any significant similarities. Error, certainly at me. If you know it precisely. Thanks you for specification. I cannot find all my memo of 1973, therefore all names about which I do not know, I wrote names from P.Lukojanov's notes which he have it come through 2 … 3 hands (ears). I am personally familiar with Kuznetsov family, Altshuller family and Krivov family. Through friends I am familiar with Valentine Zemljanov. About names of other people I can not know, as I operated only with surnames at a writing of official documents. Therefore in their names of the others person I can be mistaken. PS.ViktorV, I think that at this forum we should communicate in source language - English. If it is necessary to learn that another in Russian it is better for making through an e-mail. If we communicate here in Russian we will show disrespect for other participants of a forum. The most part from them does not know Russian, therefore it is better than it not do.